Please tell us a bit about MVTec and your role in the robotics industry. MVTec has been known as a leading provider of standard machine vision software for more than 20 years and has played a major role in shaping technical developments in this field. The technology occupies a key position in the automated production environment, particularly in robotics. Robots must be able to see in order to ensure efficient manufacturing processes. Machine vision makes this possible utilizing cameras and intelligent software, which can be used to further process the recorded digital image data. This paves the way for a wide range of application scenarios within the Industrial Internet of Things (IIoT, also known as Industry 4.0), such as safe interactions between humans and collaborative robots (cobots). Robotics is thus proves to be a very important application for our software. Embedded vision seems to be one of the big embedded trends. Where does this come from? The use of compact devices that run embedded software is becoming increasingly popular in industrial environments. From smart cameras and vision sensors to smart phones, tablets, and handheld devices, it is almost impossible to imagine connected and highly automated Industry 4.0 processes without these small devices. They now have powerful industry-compliant processors, which also permit complex machine vision tasks. Robust machine vision software is needed for this purpose. It needs to run smoothly on these compact devices and must be compatible with a large number of platforms, such as the ARM® processor architecture. The importance of the IIoT increases rapidly. How can embedded vision technologies contribute to streamline the processes in this field? IIoT environments typically have many sensors and cameras, mounted in different locations, which continuously monitor practically every production step. Most of these sensors work with machine vision technologies. They can then be used for a wide range of tasks, such as recognizing and identifying objects, positioning and handling workpieces as far as for defect inspections. Machine vision effectively acts as the "eye of production" in this case. What are the challenges in bringing powerful machine vision software on smart mobile devices? Compared to stationary desktop systems, mobile devices are more limited in terms of their processors, memory and hard disk capacity, and therefore also have less computing power. In order for the machine vision software to reach an acceptable processing speed, it must be based on a powerful library. Only a few machine vision solutions are up to this challenge. HALCON Embedded offers robust machine vision functions, for example on Android-based mobile devices. Which special use cases for embedded vision do you see in this area? Embedded technologies, for instance, make it possible to run even complex machine vision functions on a wide range of mobile devices. With optical character recognition (OCR) techniques, for example, number and letter combinations can be read out with mobile handheld devices to reliably identify objects — even if the characters are hard to read, distorted, or blurry. Predictive maintenance processes are also conceivable. Smart sensors and integrated machine vision software can thus be used to continuously monitor machines. If abnormalities are detected, this is a sure sign that a system is about to fail. In this case, counter-measures can be taken in time. Can you give us a short description of a typical scenario where embedded vision technology would be beneficial? Mobile maintenance and configuration of machine fleets are important when using embedded vision technologies. For example, smart phones, phablets, and tablets can be used to take snapshots. Service technicians can identify defective components in a control cabinet by pointing their mobile device toward the cabinet. The integrated machine vision software reliably recognizes the component to be replaced. The technology also supports the preparation of a so-called multimedia manual. Employees can use their mobile devices to identify different components and thereby download instructions for certain maintenance steps or to obtain additional information online. Established embedded systems like the ARM® architecture are employed in numerous mobile devices. How can you use this technology with standard machine vision software? ARM is a very widely used and popular architecture in the embedded sector. Cameras and sensors are also becoming increasingly smaller in the non-industrial environment and frequently have ARM processors. With the new release 13.0.1 of our standard MVTec HALCON software, we now make robust machine vision technologies available as standard equipment for ARM-based platforms running the Linux operating system. As a result, users can use the wide range of machine vision functions on compact and robust hardware devices such as smart cameras and mobile vision sensors. In this way, we address the exact needs of the rapidly growing embedded vision market. How do you see the future unfolding as far as new methods and technology in the manufacturing process? We expect machine vision to be used in additional links along the industrial production chain in the future. The technology will thus encompass ever more user groups, which will present new challenges. The aspect of interoperability, i.e. communication with the overall system, is very important in this context. Standardized communication protocols, such as OPC UA, will be needed for this purpose. Due to the extensive field of application, robust algorithms are also needed. And finally, usability will also be increasingly important. After all, system adaptations must be implemented as quickly as possible and without requiring a lot of expertise. Johannes Hiltner is a product manager at MVTec Software GmbH and responsible for the HALCON software, which is the company’s flagship product. Johannes Hiltner joined MVTec Software GmbH in 2008 and started off as an application engineer in the Solutions + Services department, being responsible for customer specific software projects as well as customer trainings and evaluation of applications. 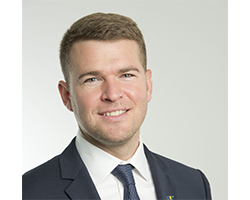 In 2013, Johannes Hiltner switched to the Sales department, where he was the contact person for MVTec’s distributors in European and Latin American sales regions. Since 2015, Johannes Hiltner is working in his current position as product manager for HALCON.